Giving your home a completely new and updated look can be achieved by having new siding installed on your home. New siding can make your home look new and fresh and can increase the curb appeal of your home as well which means the value of your home will go up. There are many different siding choices for home owners in Michigan today and each have their own advantages and disadvantages. 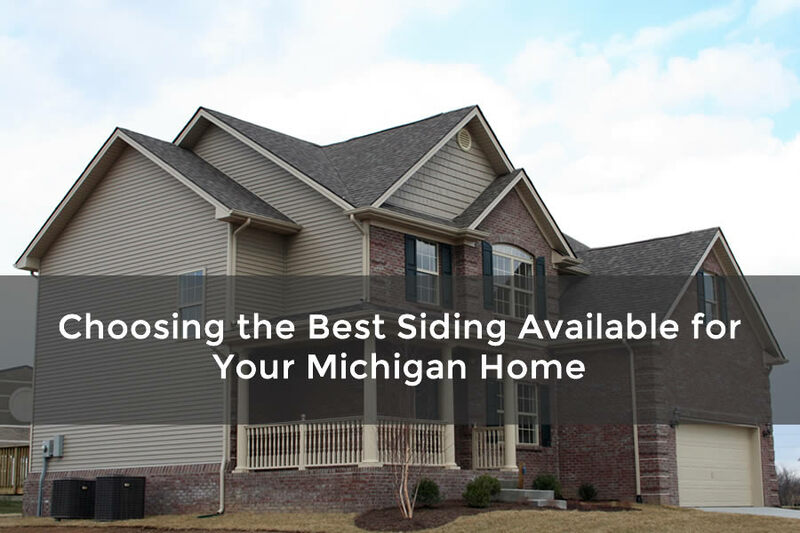 We’ll take a look at some of the top siding choices that siding contractors are installing on homes that are used in Michigan today and discuss why they may be a good fit for your Michigan home. Wooden siding has been around for many, many years and continues to be one of the best choices for home owners that want an amazing look for their homes. Most siding choices attempt to look like wooden siding but in order to really get the look and feel of wooden siding you’ll need to actually use wooden siding. There are some disadvantages of using wooden siding however. The first is the cost of wooden siding. For higher grade wooden siding the cost is usually expensive. Another problem is that wooden siding needs regular maintenance. Treating the siding for insects and rot damage needs to be performed regularly to keep the siding looking great. And if you’re painting the siding, it will need to be painted regularly as well. Metal siding is used for many commercial buildings and is not as common to be used on residential homes. While metal siding can work great with little needed in terms of maintenance it may not hold up well in a residential setting. Aluminum siding was once used on homes but was replaced quickly by vinyl siding which holds up better and is less expensive. The cost of metal siding can vary widely because of the raw materials needed to make this siding. For residential homes that want metal siding usually the siding is much thinner than commercial type metal siding. So during storms the siding can be dented and damaged easily. Fiber cement siding is another very popular choice of siding for home owners in Michigan. One of the more popular brands of fiber cement siding is called James Hardie siding. This type of siding is relatively new when compared to the other siding choices in Michigan but has certainly gained a lot of popularity very quickly. Fiber cement siding is very durable and can come pre-painted with a guarantee of 25 years depending on the brand and quality. There is a trim system also so making the home look great can be achieved with this siding. Fiber cement siding is more costly than vinyl siding but looks great and isn’t affected by rot or insects like wooden siding is. Vinyl siding is one of the most popular types of siding used today because it performs great and it’s also very economical to have installed on your home. Vinyl siding requires very little maintenance other than cleaning from time to time. It typically doesn’t dent but can crack especially during colder winter months here in Michigan. One of the great features of vinyl siding is also how it looks. There are many different colors and designs you can choose from to completely change the look of your home.